The basal nuclei (or ganglia) are situated inside the white matter in the basal part of the cerebral hemisphere and large subcortical masses of grey matter. Functionally, basal ganglia also contain substantia nigra, red nucleus and subthalamus. The basal nuclei are important in arranging and coordinating motor movements. The major function of the basal nuclei is to reduce muscle tone and inhibit unwanted muscular activity. Topographically, it is just about entirely split into the caudate nucleus and the lentiform nucleus by a band of nerve fibres, the internal capsule. It is situated lateral to the thalamus. However, across the anterior limb of the internal capsule, the anteroinferior ends of these nuclei remain linked by a number of bands of grey matter. These groups give it a striated look, therefore the name corpus striatum. Phylogenetically, corpus striatum forms 2 distinct functional components, the paleostriatum and the neostriatum. The lentiform nucleus is composed of 2 parts: a darker lateral part putamen and a medial paler part globus pallidus. The globus pallidus is relatively ancient and named paleostriatum/pallidum. The caudate nucleus and putamen being recent in development, collectively create the neostriatum/ striatum. 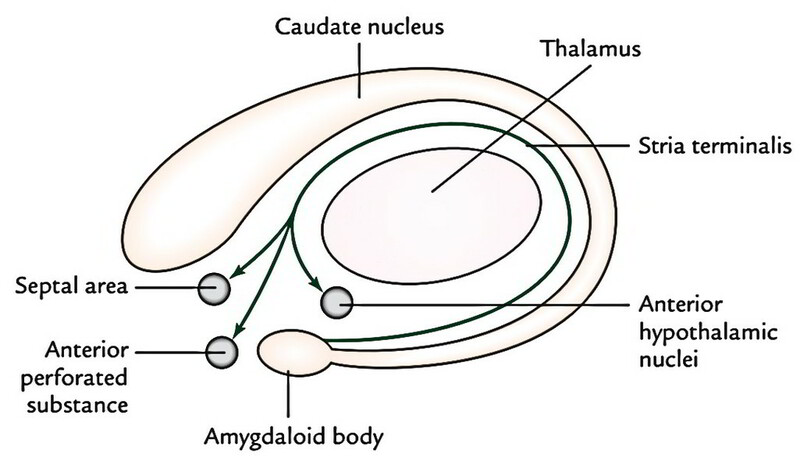 Caudate nucleus is a large comma-shaped mass of grey matter, which encircles the thalamus and is itself encircled by the lateral ventricle. The whole length of its convexity projects into the cavity of lateral ventricle. Its rounded anterior part in front of interventricular foramen is called its head. The head gradually and imperceptibly tapers caudally into the body and then into a tail, which merges at its anterior extremity with an almond-shaped mass of grey matter referred to as amygdaloid body. Lentiform nucleus is a large lens-shaped (biconvex) mass of grey matter underneath the insula forming the lateral boundary of the internal capsule. In horizontal section of cerebrum, it appears wedge-shaped with broad convex base directed laterally. It’s divided into 2 parts by a vertical plate of white matter (external medullary lamina): an outer dimmer part, the putamen and an inner lighter part the globus pallidus. 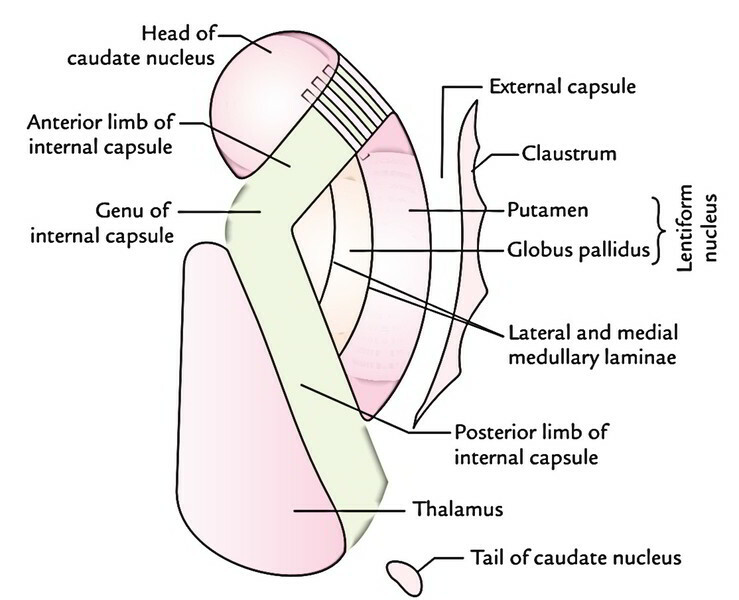 The larger lateral part, the putamen is composed of densely packed small cells and is structurally similar to the caudate nucleus. The globus pallidus is smaller medial part and consists of large (motor) cells. It is also referred to as pallidum as it appears pale in section (pallid = light). The globus pallidus is further subdivided by an internal medullary lamina of white matter into outer and inner segments. The striatum (caudate nucleus and putamen) is the receptive part while globus pallidus is the efferent part (outflow centre) of the corpus striatum. The globus pallidus sends fibres to the thalamus, subthalamus, substantia nigra, reticular formation and red nucleus. The striatum gets fibres primarily from the cerebral cortex, thalamus and substantia nigra. Different pathways involve different neurotransmitters, which contain dopamine, acetylcholine, glutamate and y-aminobutyric acid (GABA). Claustrum is situated between the putamen and insula. It is a thin saucer-shaped mass of grey matter. Amygdaloid body, lying anterosuperior to the tip of inferior horn of lateral ventricle, is an almond shaped mass of grey matter in the temporal lobe. It’s situated deep to uncus, which acts as a surface landmark for its location. The fibres, which follow the inner curve of the caudate nucleus and terminate into septal area, anterior perforated substance and anterior hypothalamic nuclei, originate from amygdaloid body form stria terminalis. The stria terminalis is the primary efferent tract of the amygdaloid body. Developmentally it is related to the basal nuclei but functionally it’s included in the limbic system and therefore, shares its functions. The substantia nigra is made up of deeply pigmented nerve cells which contain melanin (a polymerized create of dopamine) and iron. The structure of tectum and tegmentum deviate at different levels; therefore, it’s again best studied by examining the T.S. of the midbrain at the subsequent two levels: at the level of the inferior colliculi and at the level of superior colliculi. Reddish nucleus is a cigar shaped mass of grey matter which appears ovoid in cross section. It is about 0.5 cm in diameter. It’s situated in the tegmentum, ventral to the 3rd nerve nucleus and dorsomedial to the substantia nigra. It’s an essential nucleus of the extrapyramidal system. This small nucleus resembles a biconvex lens in coronal section and is stuated in the ventral part of the diencephalon, which. It is located caudal to the lateral half of the thalamus and inferomedial to globus pallidus. It’s divided from thalamus by a smaller nucleus named zona inserta. Concerned with preparation and programming of voluntary movements. Ascertain how fast a movement is to be performed and how large the movement must be. Reduce muscle tone and inhibit unwanted muscular process. Control the muscle tone and thus help in smoothening the voluntary motor activities of the body. Control automatic related movements, like swinging of arms during walking. Control group of movements responsible for emotional expression. The lesions of basal ganglia result in different kinds of unwanted involuntary movements and disruption in the muscle tone. These disorders include Parkinsonism chorea, athetosis and ballismus. This disease generally occurs after 50 years of age because of deficiency of the neurotransmitter dopamine in the corpus striatum following a lesion in substantia nigra and/ or its nigrostriate fibres. Lead-conduit or cogwheel type of muscular rigidity. Mask-like face or loss of facial expression. General slowing-down of movements and absence of associated movements, such as arm swinging during walking.